When he’s not a director at Fennemore Craig, Julio Zapata works with various community organizations to help the less fortunate learn the skills and insights necessary to achieve a greater socioeconomic level. When Julio Zapata was 12 years old, he won a $500 vocational scholarship from the Orange County Register, which asked him, for an article about the award, what he wanted to be when he grew up. 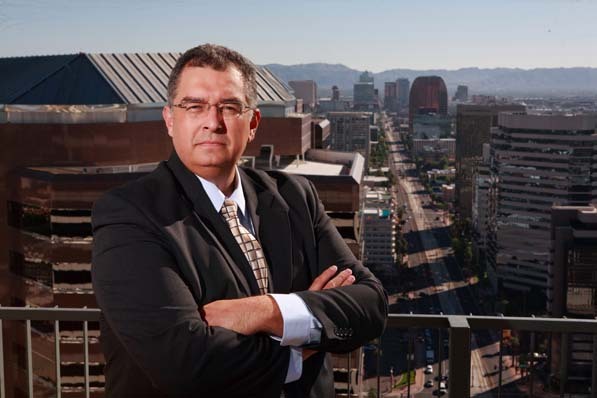 “I said, ‘I don’t know, a lawyer maybe,’” recalls Zapata, who is now a director at Fennemore Craig, a Phoenix-based full-service corporate law firm with nearly 200 attorneys. But, beyond his legal day to day, Zapata is putting his talents to use in the community. Why was being a lawyer a childhood dream? I had a lofty, idealistic view of helping others, and from a child’s eyes, I admired how that could be accomplished via the legal system. My parents came to the United States from Mexico, and I was the first family member born here. I watched my parents struggle a lot. My dad retired making $10 an hour as a concrete laborer. My mother suffered from cancer. It was difficult seeing the struggles they were going through on a modest income. Did you make the decision to go to law school early? No, after high school I was a professional photographer for seven years, but then I was involved in a serious auto accident and reevaluated my life. That’s when I decided to chase my childhood dream of being a lawyer and went back to college and law school at age 30. I was the first member of my family to go to college. The Latino community being a role model in society. Do you ever look back and realize what an achievement that is? I look at life now and see that the lifestyle people in the legal system can achieve is something that should be balanced with what is important in life, so I’m involved with a lot of organizations that seek to bring people to a different socioeconomic level. I’ve been involved with the Arizona Latino Arts and Culture Center, which promotes the education of Latinos through the arts, for two years. It cuts through the views many people have of Latinos, especially in Arizona. We have events that attract folks from outside the Phoenix area, such as Scottsdale, an affluent suburb, and seeing Latinos produce beautiful art and music changes their perception that the area is low-income and dominated by gangs. You were also previously involved with the Hispanic National Bar Association. I was a regional president. [The Hispanic National Bar Association] is a nonprofit organization that promotes the increased representation of Latino lawyers. It’s very intent on getting more Latino state and federal judges appointed so their makeup is more representative of the populace, not just in term of heritage, but in terms of what Latinos go through. For example, having grown up as a child with modest means, I know that if I were a judge listening to someone who grew up the same way, I’d be more apt to relate to his or her situation. Do you think the presence of Latinos in the legal realm is increasing? The presence of Latino lawyers is increasing, but their representation among large law firms has not. We’re still struggling to integrate the Latino lawyer in what is still predominately a white culture, by which I mean there are perceptions of what a Latino lawyer should be. As an example, a senior partner at a large law firm once looked at me and said, “Your parents must be very proud.” I said, “What do you mean? Your parents must be proud, too.” He replied, “But look at where you came from and where you are.” When you’re perceived that way, it’s almost like you’re not an equal. I think Latino lawyers tend not to want that battle and end up leaving for organizations at which they feel more comfortable, such as the government.